When I moved to New Orleans in 2001, Michael Tisserand was then editor-in-chief at Gambit Weekly. When I worked there, I found him smart, funny, and deeply sympathetic to writers in a way that we all missed once he quit Gambit after Katrina to become a professional author. Before Michael evacuated, he had begun an ostensible Gambit cover story about New Orleans-born-Los Angeles-raised George Herriman, who drew comics that weren’t traditionally funny — most notably, the much-dissected, early twentieth century cartoon Krazy Kat. “The last thing I did before I evacuated Katrina was put that stack of Inks comics magazines about Herriman up on my desk so they might stay dry,” says Tisserand. Over ten years later, in December 2016, Harper Collins will release Tisserand’s 560 page book Krazy – George Herriman, a Life in Black and White. As with the best art, part of Krazy Kat’s fun is learning to understand the artist’s personal language. The central conflict of Herriman’s masterpiece strip revolves around a dog (Offisa Pup) who is in love with a cat (Krazy), who is turn in love with a mouse (Ignatz), who hates said cat. At its core, Krazy Kat was all about disrupting the “natural” order of things. 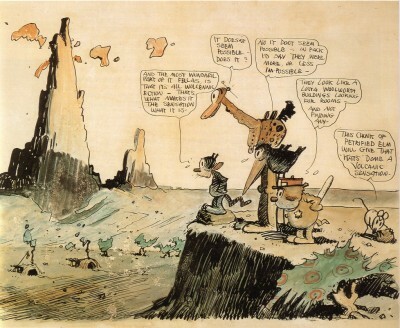 “Like the background scenes of Coconino County where he lives, Krazy’s gender and race shift, at random sometimes, but more often according to his social situation,” wrote Elisabeth Crocker in the Herriman essay, “Some Say it With A Brick.” Scholars seem to agree that Herriman used Krazy Kat to express his own poetic feelings about living his bi-racial existence in America. “Krazy’s dialect itself is the entire rude language of America, from Creole to Spanish,” Tisserand points out. Herriman’s was a special case. Even though Krazy Kat did not set the world on fire at the time, the strip was supported wholeheartedly by Herriman’s employer and fan, newspaper magnate William Randolph Hearst. Currently a Lusher chess team coach, Tisserand previously published The Kingdom of Zydeco, about the history of the famous genre of rural Louisiana dance music. After Katrina he wrote Sugar Cane Academy, a memoir of sorts about helping to start an unusual school for his children in Katrina’s turbulent wake. Brian Walker, son of Beatle Bailey creator Mort Walker, currently writes for the cartoon Hi and Lois. Much of his academic work revolves around the study of Herriman. “I though [Tisserand] really had his work cut out for him, because Herriman was kind of a mystery man even during his lifetime,” says Walker. “In the end [Tisserand’s] book is interesting because there has been a lot written about Herriman’s art, but they were mostly visual compilations, whereas this is the first real scholarly work. Images via Wikipedia and Wiki Commons.